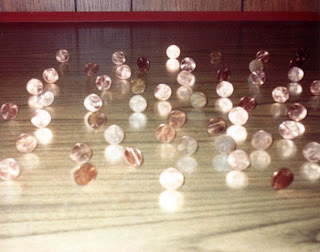 One evening in college I wasted time by standing pennies on their edges on my desk. This took quite a while and required a steady hand and a steady floor. Then I took pictures. I really should have been studying. I'm a master at doing frivolous and useless tasks when more important things need to be done. The end result looks cool, but doesn't really accomplish anything. Blogging is a lot like standing pennies on their edges. I should be doing other things but here I am, chattering on and on and wasting time. I won't quit though. I do need some fun in my life. I feel a lot like a penny on its edge, just waiting for the slight jiggle that will knock me over. The kids are home today, thanks to this country's need for presidents combined with a penchant for giving postal carriers, government workers (including many teachers), and some bank employees a day to rest from their weary labors every so often. So I will get nothing done today because I have a hard time using my time effectively when there are children around to need my help with things. I'll just stand pennies on edge to pass the time between requests from children or nagging them to do something. Also, happy birthday to my dad. You don't have explain away why you must waste time. It's the American way. Having a blog isn't a time waster; there are some people who are genuinely interested in what you've got going on in your little life. You are definitely better about keeping people updated than me. I feel most days like nothing is quite riveting enough to post about. And I don't have the talent to ramble on about nothing. 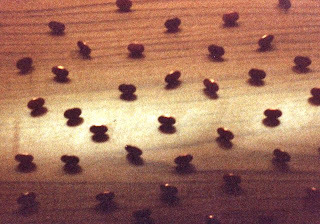 Your blog is so much cooler and more useful than pennies standing on edge, but the pennies are cool, too.